Swimming, snorkeling, diving, or even spending some time at the beach gives us an opportunity to watch marine animals in their beautiful habitat. Unfortunately, sometimes, inappropriate interactions with some of these water creatures, like stingrays, can result to serious injuries. Underwater enthusiasts spend millions of dollars every year to see different types of stingrays. However, since the catastrophic death of Australian crocodile hunter Steve Irwin that happened in 2006 due to a spike from stingray, many have considered diving with stingrays a life threatening undertaking. But here is the thing. Rays are not aggressive. They are calm and peaceful most of the time but if you disrespect their personal space, they will feel threatened, and could plunge their sharp barb through your wetsuit and right into the flesh. We are going to discuss a few precautions that you can take to ensure safe diving with stingrays so you can enjoy this amazing experience. 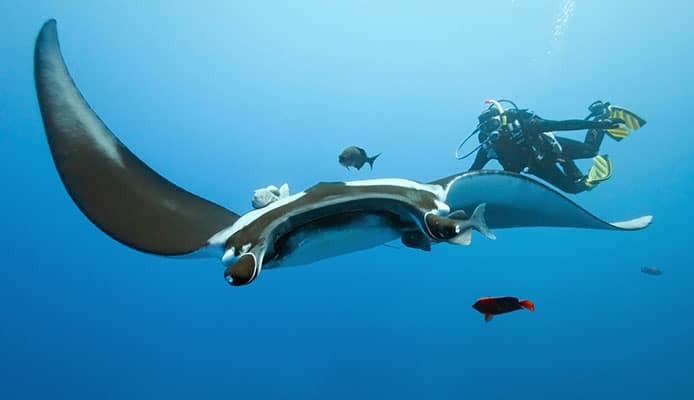 Diving with rays is way safer that diving with sharks. Stingrays are shy and docile fish and unlike sharks, a ray won’t attack unless disturbed. Stingrays see and move forward easily, so if you are diving or swimming close to one, always leave a forward escape route for it. A ray doesn’t want to feel cornered or trapped against a reef, so it will get aggressive whenever it senses a threat or feels offended. By all means, avoid floating in the area directly above it, as this is considered its striking zone. A startled stingray can easily strike in this area by curving its stinger forward. To be safe, consider floating at the space behind its back or sides, as these areas will be difficult for it to reach without making some swimming adjustments or turning its body. Most stingray injuries happen on shallow waters when a diver accidentally steps on a stingray. Rays love to rest and feed in these areas and stepping on it will frighten it, which will automatically activate its defense mechanism. It will quickly whip its tail forward and then down to sting your foot so you can remove it from its body. The best stingray safety measure to observe when entering or exiting warm shallow waters or taking a walk in the beach is to keep your eyes open. To avoid putting your foot on top of a resting stingray, you can shuffle your feet when entering or exiting the waters or even throw shells or rocks in front of it to warn it. Be especially wary of rays camouflaged and hiding out in sand waiting for fish to eat, as these may be hard to spot. As a general beach safety, a diver should be familiar with the common stingrays’ habitats like long, sandy shores. Not even your scuba or snorkeling fins or water shoes will protect you from a ray’s hard, sharp barb, so be cautious if you find yourself in a stingray territory. A stingray injury is not usually fatal but can be really painful. A single sting can cause lacerations or even puncture wounds. The barb contains a thin sheath that carries a poisonous substance, which is released into the surrounding flesh, causing cell death. Deep stings can easily reach your large arteries and if the stinger breaks inside a wound, you may require surgery. Treatment of a stingray injury will vary depending on location, type, and severity. Small injuries can easily be treated on site using a simple first aid kit. Just clean the wound and try to control the bleeding. If the barb broke inside the wound, it would be wise to involve a medical professional. Injuries near the abdomen, chest and other vital organs should be taken seriously too. Stingrays are some of the most adorable fish species to watch, yet some of the most dangerous. Following stingray safety precautions however can help you stay safe near these creatures and enjoy your underwater or beach adventures. The rule of thumb is to know their habitats and leaving them an escape route when swimming near them underwater. And if you get stung, apply antibiotic ointment to neutralize the venom and if necessary, seek medical assistance.